Nintendo of America have released details of the latest content to be released across Virtual Console, WiiWare and Nintendo DSiWare download services. Whilst I’m sure the arrival of Chrono Trigger on Virtual Console is enough to divert your attention (if not, go check it out! 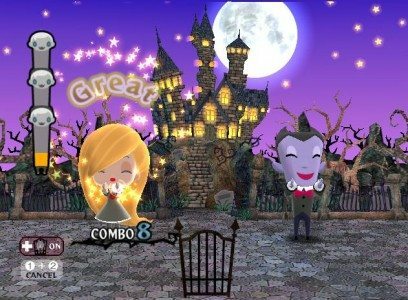 ), this week also brings a new WiiWare Demo in the form of Lead the Meerkats from Lapland Studio, as well as a trio of titles on Nintendo DSiWare and Natsume’s Gabrielle’s Ghostly Groove: Monster Mix as a full WiiWare release. A young man is transported into the past, altering the course of history and the outcome of the future. He has to find his way home, but first he must travel to the outer edges of time to repair the world’s chronology. On the way, he encounters strange friends and foes, uses incredible devices and vehicles, and penetrates and neutralizes the fortresses of the past, present and future. A paradox has been created. If he does not restore the order of time, nothing will ever be the same. He is the one who will become a hero. He is Crono. Join Gabrielle and her monster friends as they dance along to a spooktacular selection of songs. Grab your Wii Remote™ controller and dance along as you shimmy, shake and spin in time to the music. There’s trouble in Monster Town: Vlad the Vampire’s loyal zombies have disappeared. Gabrielle and her monster friends will have to bust some serious moves on the dance floor in order to lure them back. Along the way, maybe they can uncover the identity of the mysterious creature that’s terrorizing Monster Town’s zombies. Up to four players can show off their best moves in the game’s multiplayer mode. (Additional accessories are required for multiplayer mode and are sold separately.) Short and full versions of songs let you dance as much as you want. Unlock tons of outrageous outfits and items. In Lead the Meerkats, you are a young meerkat who has a lot to accomplish. You’ve been separated from your pack, and the time has come for you to form your own meerkat pack. Are you ready for the challenge? Name your pack and its meerkats. Dig burrow networks and enlarge your territory. Forage for food and grow your pack size. Stay on guard and be ready to make quick decisions. Run to the safety of the burrows or fight your enemies. Go head-to-head with a rival meerkat pack. Lead your pack to victory and rule the savanna. Lead the Meerkats is the first game to simulate the exciting life of meerkats. Lead your pack and enjoy the company of these lively and endearing animals. Lead the Meerkats offers fun game play for animal lovers of all ages. Big Bass Arcade is all about the action where the bass are biting and fighting. Catch a boatload of fish and take a shot at the world-record bass. The game is packed with features: seven different lakes, nine lures, three multiple-lake tournaments, 42 events, high scores for each event and the elusive world-record bass. Big John Games brings 17 years of fishing game experience to Big Bass Arcade to create incredible fish behaviors, spectacular animations and second-to-none fish AI. Putting the fun back into hand-held fishing is the name of the game. Players choose from two control options – stylus or +Control Pad – for casting, reeling and controlling the fish-fighting action. Big Bass Arcade appeals to fishing enthusiasts and gamers alike by capturing the adrenaline rush of fish-fighting in an arcade-style game. You’ll need a keen eye and a quick mind to complete 100 themed word-search puzzles. Word Searcher 3 contains fun words from multiple categories including astronomy, currency and rivers. Packed with a huge assortment of subjects to choose from, there’s sure to be a puzzle anyone can enjoy. Keep your vocabulary, memory and problem-solving skills sharp with these challenging puzzles. Keep track of – and try to beat – your own play-through times again and again as words are scrambled every time you play. Imagine a coloring book on your Nintendo DSi™ system, add the ability to create your own drawings and to draw over photos, and you’ve got Hellokids. Color and draw using the Nintendo DSi stylus. Enjoy more than 150 drawings you can color with three difficulty levels, including a “color containment” assistant. A Freehand Drawing mode includes simple, practical tools, such as an automatic fill function, a color palette and decorations. You can also draw on a photo you’ve taken or uploaded from your Nintendo DSi album. Hellokids is a great pocket companion for all budding artists.